2019 is the third year that the Saskatchewan Craft Council has participated in HomeStyles at Prairieland Park, thanks to the support of Creative Saskatchewan and the Saskatoon & Region Home Builders’ Association. This year we took over 240 works of contemporary craft from 45 different juried SCC artists. Our booth showcased an array of work from glass, ceramics, fibre, soapstone, painting, photography, metal sculpture, to fine furniture. 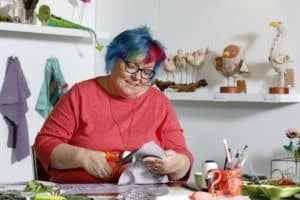 The aim of the SCC at an event like HomeStyles is to enlighten the public about fine craft; how it can be a special part of people’s homes and lives. We were also looking to sell work to people who haven’t had the opportunity to come to our gallery. 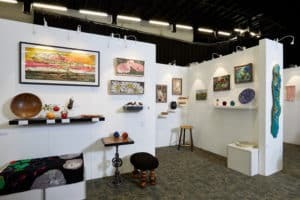 Our role as Saskatchewan Craft Council staff members is to speak with visitors about our organization, how we give support to our artists in their careers or practices, and illuminate our involvement in the fine craft community of Saskatchewan and beyond. Another draw to our booth was our HomeStyles Craftsperson in Residence Dawn Rogal. The printmaker and fibre artist created a one of a kind piece during HomeStyles. We enlisted her to recreate her studio space as part of our booth. 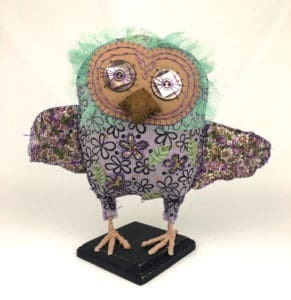 Over the course of four days, Dawn created an owl named “Hoot.” She started with hand-dyed fabric, carved out stamps to print on the fabric, hand-stitched the body and face of the owl, made legs, and assembled the critter. It was an interesting experience for people visiting our booth; we were able to provide them with a glimpse into the process involved in making work, as well as an opportunity to speak with Dawn about her process and see the creation come to life! You can purchase “Hoot” here. We are so grateful and thankful to Dawn Rogal and all of our other artists that participated in HomeStyles 2019! If you missed the chance to see us in person, all the artwork from HomeStyles is available on our online store until April 7th, 2019.